Time plays a significant, influential and useful role in our lives. Our daily routine is time-based and time-bound. The origin, being and cessation of things, objects, events, thoughts and life systems are time-related. All natural, man-made and man-initiated processes take place according to time and its passage. In all disciplines of learning Time has a prominent role to play. Physics is a natural scientific discipline which deals with matter, energy, time and space and actions and inter-actions concerning matter and energy in space and time. Thinkers have been attempting to understand the nature of time since the start of civilizations. Many intellectuals through generations have been expressing thoughts which aid us in the understanding of the nature and structure of time. Ancient Indians, the Chinese and the Greeks have made substantial contributions in this regard. Thus we ‘know’ what Time is. Earth spins around itself and simultaneously revolves around the Sun. Based on these movements, day and night are created and the passage of time is observed, experienced and measured by us. We have knowledge of the extent of passage of time by referring to watches, clocks, various time-measuring devices, calendars, almanacs etc. 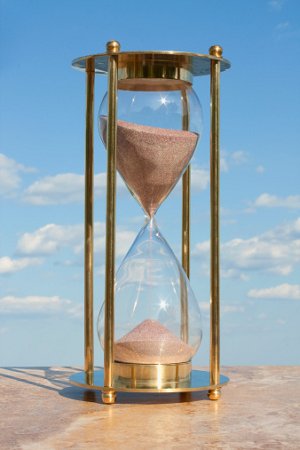 The awareness of Time through these measures is only a facet of nature of Time and is not comprehensive and complete. Awareness of nature of Time is varied and is not unique. Like the understanding of Divinity, the understanding about Time is multiple. Time has many forms, structures, natures and has been viewed, defined and understood variedly. An attempt is made in this article to get a comprehensive understanding of time using basic physics principles. Time’s nature when studied reveals two aspects of itself – durational (period) and metrical (counting). We are aware of both these aspects in our daily worldly and scientific usage. We have pendulum clocks, mechanical watches, clocks, quartz crystal clocks, electronic clocks, atomic clocks…..calendars, almanacs….to monitor and measure time as a duration, count of the period of existence of such a duration and also passage of time as a function of and series of seconds, minutes, hours, days, months, years, decades, centuries, epochs….etc. Counting of Time as a period of pronunciation of alphabetical letters is also available to us. When we analyse it would be interesting to note that in all time-measuring devices, internally an energy transformation takes place. This energy transformation within such devices takes place as aperiodic, linear or periodic (harmonically), in the form of mechanical, electrical, electronic or atomic energy form. This energy transformation is the result of mechanical, electrical, electronic or atomic process taking place and going on within and the same is manifested as movement of hands or display of digits on the dial depending on the technology used. Thus Energy-Presence and transformation of that energy from one form to another form are essential for time-measurement and monitor passage of time and even for time to exist. Energy-Presence gives scope for durational aspect of time. Thus Energy-Presence is Time-Space. Time-space as Energy-Presence can be termed Static Time or Time at Rest. Transformation of such an Energy-Presence creates time-flow or passage of time. This time-flow within a time-measuring device monitors time-flow or time-taken concerning an external on-going process-physical, chemical, biological, astronomical, cosmological or psychological. Energy Transformation is the time-flow aspect of Time which when divided as seconds etc., becomes metrical aspect and is dynamic aspect of Time. So energy-transformation is Dynamic Time or Time in Motion. The rate of this Energy-Transformation decides the speed of respective time-flow. The above observations can lead us to look at the nature of time in an interesting way. Energy Presence (Time at rest) can be potential, example: wound spring in mechanical watch, height of water in water clock or in a kinetic form ex: pendulum- oscillations in a pendulum clock or crystal oscillator in a quartz clock. And Energy-Transformation (Time in Motion) that moves the hands of clock or display of digits as the case may be, can be linear (unwinding of spring in a mechanical watch) or (periodic) cyclic (crystal oscillator motion in a quartz clock). The linear or periodic transformation of energy takes place in a regular way in the Universal Time-space to measure the duration and monitor the Time taken for a physical, chemical, biological, astronomical, cosmological, social, political,…etc process or event. Energy-Presence can also be referred to as time-space. Thus Energy- Presence, Energy –Transformation, Time, Time-Flow, Passage of Time and Measurement of Time are closely related. Time at Rest as Energy-Presence exists infinitely with possibilities to become Time in Motion as Energy-Transformation as many times at as many places with or without actions or interactions with matter. (Universal Time exists as the duration of and passage of time as contraction and expansion of Universe. Thus Universal time is the period of Universe’s oscillations as contractions and expansions). Time-scales to measure duration or passage of time have been and still are different for different civilizations, cultures, religions, regions, nations, geographical locations and natural processes. Calendars, almanacs, etc., vary accordingly. The well- known and popular Indian ways of measuring Passage of Time are Chandramana ( lunar, relating to moon’s transit), Sauramana (solar, relating to sun’s transit) and Barhaspathyamana (relating to Jupiter’s transit ). Jews, Christians, Parsis, Jains, Buddhists, Zorastrians, Muslims etc. have still different calendars of their own. Many put forward various propositions on the locus (Path) of Time while ‘flowing’. Ancient Indians proposed cyclic path. We all modern people are following the idea of Galileo that Path of Time Flow is a straight line. i.e.,linear passage of Time. Our experience and observation sense two existences of Time. They are Physical Time and Psychological Time. These two times will be viewed and commented here. Physical Time: Natural Sciences such as physics, chemistry and biology understand Physical Time variedly. Movement, change and becoming as given by Zwart are three classifications of Physical Time. These may be understood by observing physical, chemical and biological processes as follows. iii) in a state of motion. Aristotle opined Time as counting of and reciprocal of motion. Motion associated with matter can be translational, rotational and vibrational and periodic or non-periodic. Plato opined Time to be generated by cosmological movements. Thus movement has been construed to be Time and also the cause of Time. Change: The phase or state of matter is changed by energy. The form of energy is changed through matter. Thus transformation of phase or state of matter or form of energy takes place with mutual help. Natural or non-natural processes involve transformation of both matter and energy bringing out changes within or without of matter. Heat energy changes ice (solid) into water (liquid). This is the macroscopic change of phase of matter which reflects the microscopic change of phase of matter which reflects the microscopic – atomic or molecular changes within the matter. Changes in the nucleus of an element also take place at the respective Energy and Time scales giving raise to nuclear changes of matter. The atomic and nuclear changes take place involving rest and change of place (movement) of atoms and molecules in atomic and molecular spaces relating to respective micro-energy and Time-Scales. Human sense organs can not sense all the magnitudes of these micro-energy changes and Time-durations which take place in micro (10-6 sec), nano- (10-9 sec), pico- (10-12 sec), chronon (10-24 sec) times in micro- spaces (nm, 10-9 m). Only specific sophisticated instruments alone can sense, monitor and gauge these micro – energy changes happenings in micro -times. All physical, chemical changes have been constructed as Time. Becoming: Biology is the natural science dealing with living systems. We will be aware of physical changes of an organism – the result of physico – chemical changes within - as growth or decay. A plant becomes a tree. A girl becomes youthful. These two becomings are growth of organisms. Tree becomes dead wood. Youthful woman becomes an old woman. These two becomings are decay or degeneration of the organisms. The psychological process of a human being becoming angry and being peaceful after the anger subsides are also biological processes involving changes in and changes of psychic energy. Human knowing, learning, thoughts, perceptions, understandings and experiences are other mental processes which are becomings of psychic energy. Thus all physical, chemical, biological matter has phases of origin, being/becoming and dissolution (cessation) which are becomings associated with matter and energy. Thus becoming has also been construed as Time. The above three insights of Time as Time essentially concern changes. Thus changes of phase or place of matter or change of form of energy can be construed as Time. External monitoring of duration of these changes are measurements of Time and Passage of Time. All these measurements concern Physical Time. Thus Physical Time consists of changes and measurement of duration of such changes. Simply, change is Time. Psychological or Mental Time: We became aware that Physical Time is associated with the simultaneous revolution of earth around itself and the Sun. (This is a highly simplistic view. A more comprehensive view based on a cosmological happening which gets repeated every sixty years is the basis for the preparation of Indian almanacs. We also follow a Universal Time and maintain it by atomic clocks for our usage and reference). All the events that take place during this Physical Time are followed by us with an egoistic mind. Such an identification of ‘I’, ‘me’ and ‘mine’ with objects, persons and events creates a “Psychological Time “ in us. Such a ‘mental time’ is created in the Jagrat (Awakened) Conscious State of mind. Awakened, Dream (Swapna), Deep Sleep (Sushupti) and Wakeful Sleep (Jagrat Sushupti) are different conscious states of mind creating different phases of mind. They are structure and phases of Mental Time-Space. We know/learn and express/teach in these conscious states of mind. These conscious states or phases of mind are the result of transformation of psychic or mental energies in the Unchanging and Ever-Present Awareness present in all these conscious states as Energy-Presence. Upanishadic Wisdom calls such an Awareness ATMA or BRAHMAN. Atma is normally referred to as SELF. Atma is present in us and is the result of breathing process. According to Upanishads, Atma is the Source of Mental-Energy and Mental Time-Space. In modern scientific terms Atma can be termed as a BIO-OSCILLATOR which issues out psychic or mental energy pulses of time-period 1/10th of a second. Atma is oscillating Psychic Energy-Presence. As discussed in the earlier part of this article, Energy-Presence provides Time-Space. Atma is the Psychic Energy-Presence as Prajnanam (Prajnanam Brahma) denotes and provides Mental Time-Space. As Prajnanam, Atma witnesses all our mental activities, related body activities and happenings within and without of the body and body’s reactions as thoughts and organ-movements to the happenings. Being such an Awareness, Atma provides the energy required for guiding the mind to know/cognize/learn through sense organs, perceive, think, experience, understand, etc., and store such an information and retrieve the same in the four conscious states described above and makes us conscious of within of ourselves and without of ourselves. The continuous or simultaneous or alternate rise and set of the conscious states is also psychological –time and – time-flow. Upanishads term Awareness of Self (Atma Drishti) as Time. Such an awareness is the series of durations of single chit (psychic)-energy pulses of period 1/10th of a second. These energy pulses when reflected in Medha form Chidabhasa (reflected chit) pulses. Chidabhasa is also called as Maya (the Current of Awareness) or Pranavam (Primordial Sound). When the reflected chit-energy pulses are not transformed in Medha as antahkaranas and flow as they are, this phase of Mental Time-Space is known as Wakeful Sleep (Jagrat Sushupti) conscious state. When these reflected chit-energy pulses or chidabhasa or maya (virtual chit-energy) transform in Medha as antahkaranas – inner tools - manas, buddhi, ahamkaram and chittam the Awakened and Dream conscious states are on and function. These inner tools in the interplay of these two conscious states in the ever-present Wakeful Sleep conscious state cognize/know/learn objects and object-energy forms through active participation of sense and action organs, react through action organs, be aware of mental processes such as thoughts, perceptions, meanings, understandings experiences etc. During this phase of mental activity we are Time-Conscious (both of physical and psychological ) which are energy transformations within and without of the body. When the above mental activities involving reflected or virtual chit energy (maya) transformation cease to be and we are not aware of the calmness within us, which is the result of such a cessation of mental activities, this phase of mind gives rise to Deep Sleep (Sushupti) conscious state. This conscious state is similar to zero in number system and vacuum in physical science. This absence of mind conscious state is useful in the cognition activities. This phase of mind is thought-free. Hence Time – Consciousness-free mental state. During this mental state we are unaware of the passage of Physical Time. Then experience of Peace of Mind exists and though we are unaware of this Peace during this phase we will be aware of remnants of this Blissful, Peaceful, Silent and Time-free experience during the twilight of Deep Sleep and Awakened conscious states. This twilight phase is the phase of experience of the Self (Atma), also known as unoccupied awareness. This is the already referred to Wakeful Sleep (Jagrat Sushupti) conscious state. Peace, Bliss, Silence and Time-transcendence are experienced during this phase because no transformation of energy maya (reflected or virtual chit-energy pulses) into antahkaranas takes place and mental activities are not present but will be taking place if willed and required. Ego, the collection of thoughts about ‘I’ as body and associated personality traits, social status, ‘me’ and ‘mine’, creates vasanas (impressions/experiences). All cognition/perception/volition-related experiences are created and retrieved by the antahkarana chittam. Egoistic thoughts and actions ( with a thought and sense of ‘I’, where ‘I’ is identified with person) in Awakened and Dream conscious states creates memories (vasanas) These memories get activated later (with reference to physical time passage) and cause happiness or unhappiness accordingly in the present of physical time. The phase of mind bereft of egoistic thoughts, memories or other cognitions /perceptions/experiences is the state of Self (Atma, Ego-free) and is Time-transcendent. Actions performed or duties discharged with such an ego-free frame of mind do not create egoistic memories. With ego-free mind egoistic memories can also be erased and we can be free and unaware of past or be concerned with future relating to physical time. Awareness of the Self (Atma Dristi), the mental phase without cognitions or cognition-related experiences is transcendent to physical and psychological times (the Wakeful Sleep Conscious State). The three other conscious states – the Awakened, the Dream and Deep Sleep Conscious states are super-impositions over this state alternately. This state of mind transcends both physical and psychological times and time-flows, Antahkaranas perform various mental activities and create or retrieve thoughts/perceptions/experiences/understandings in us. Thought-flow and also the rise and fall of conscious states within us consist of psychological tune and psychological time-flow without relating to physical time-flow. Memories and record of our experiences is our psychological past and our fears, anxieties, imaginations, expectations etc., are our psychological future. The thought-flow concerning these past and future in the form of memories activated as remembrances and fear, anxiety, anticipation, apprehensions, imaginations etc., consist of our psychological past and future and gives us the awareness of time and passage of time. Thus thought-flow (reflected chit-energy transformations) is the psychological time and its flow. Through these thought-processes in the Awakened and Dream Conscious states we perceive the passage of physical time and impressions created by such perceptions on our egoistic minds we illusively experience the passage of physical time. These Time-Conscious thought-processes take place in the awareness of mind in the physical present (psychologists calculated the duration of physical present as 10-1 sec.) Egoistic and time-conscious mind activates vasanas (memories, experiences) as remembrances, worries, pleasantness etc., and anticipates in the form or fear, anxiety and thus creates past or future in the present leads to peacelessness . The aim of Spirituality is to cultivate the habit of living in the physical present with peace. This article is an experience of Physical and Psychological Times, their form, nature and transcendence in Energy-Presence and Energy-Transformation terms. Awareness of Self (Atma) is Time. Transformation of Chit energy is Time. Chinese say that Time is discontinuous. Plato is the first to distinguish Time as it is in itself from our awareness of Time and from events in time. He regarded Time as being actually produced by revolutions of the celestial sphere. Zeno related Time to motion. Aristotle (possibly influenced by Pythogorous) felt Time is counting of motion in respect of before and after. He regarded Time and Motion as reciprocal. Time does not exist without motion .Time is numerable aspect of motion. Plotonius: Motion Time can not be, since motion takes place in Time. Hiraclitus: Time signifies the period of world from its function to its destruction and rebirth. Galielo: Time is a geometrical straight line. Barrow: Time is the continuance of anything in itself in its own being. Newton: An `absolute time` exists whose equable flow is independent. Absolute, true and mathematical time of itself and its own nature flows equably without relation to anything external. Lebniz: The order of successive existents is Time. Kant: Time is an aspect of experience and Time has no existence in external reality. Einstein: Relative Time: Time is relative. Speed (passage) of time and time measurement are relative. Time is movement, change or becoming. Ramabrahmam V.: Es gibt keine Zeit. Es gibt nur Proze?en.—(There is no Time. There is only ongoing of processes).